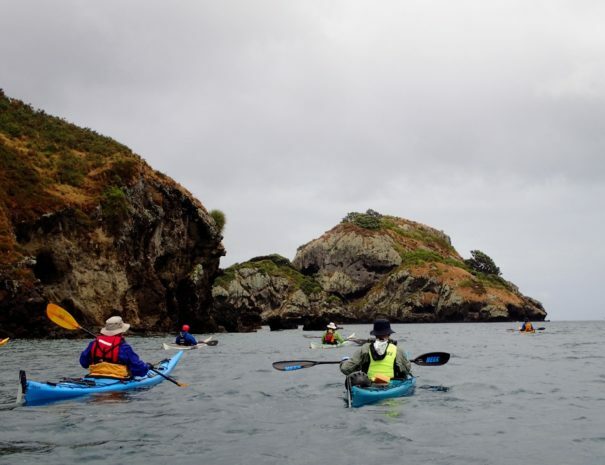 Have you been on a sea kayaking trip with us in Northland and are keen to be part of a new adventure with us? 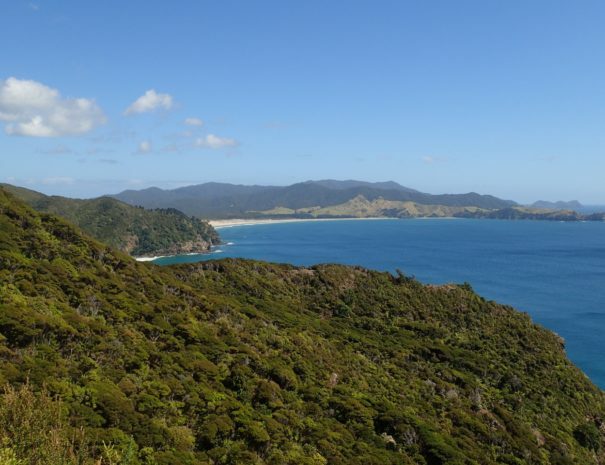 Or maybe you have always dreamt of going to Great Barrier Island and this is your opportunity? 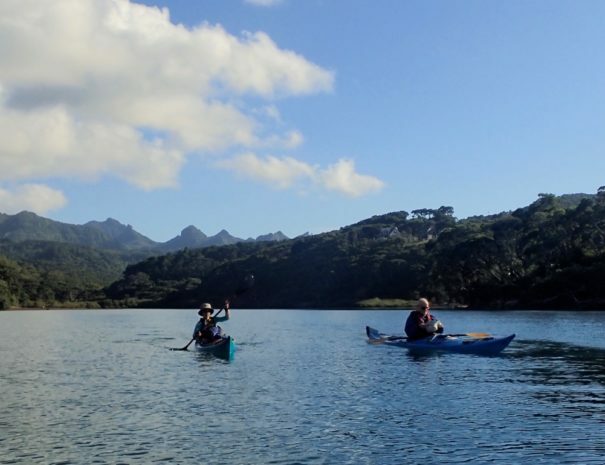 We welcome anyone with an intermediate to advanced level of sea kayaking to join us on Great Barrier Island and experience this new Kiwi expedition in a breathtaking part of New Zealand! 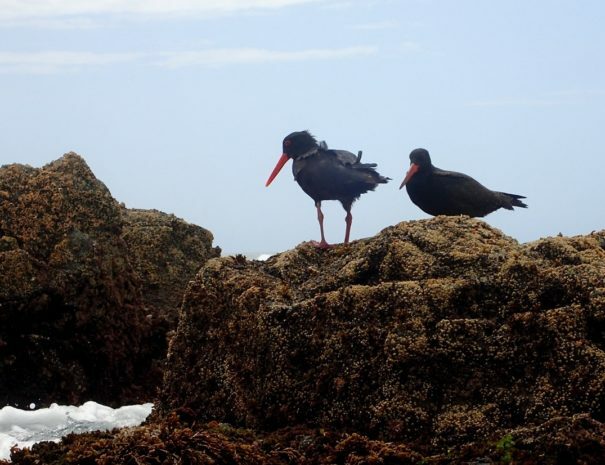 Please note that we have scheduled the expedition for January 30th – February 7th 2020, but the dates might be subject to change as we are still waiting for the ferry company to have their schedule up and running for next season. This will only affect the start and finish by one or two days. We will load the dates on the booking software as soon as possible, but while you are waiting do not hesitate to email us and show your interest. 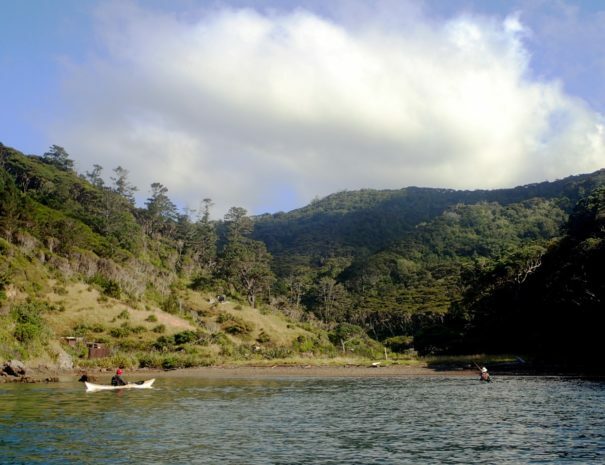 Great Barrier Island is located in the Hauruki Gulf, a 4-5 hour ferry ride from Auckland. Named by James Cook during his exploration of the Southern Ocean, the island acts as a protective barrier between the Pacific Ocean on it’s eastern side and the Hauraki Gulf to the west. Why do we love it so much that we want to share it with you? 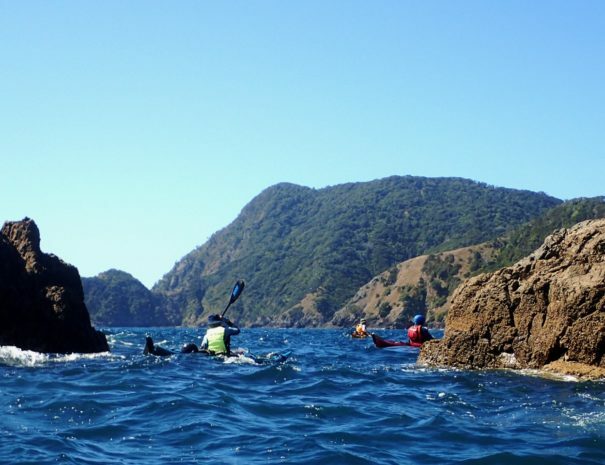 Because this is one of NZ’s unsung wilderness areas, a paradise of dense forests, convoluted coastline and craggy peaks. With wildlife that is reminiscent of NZ 100 years ago. 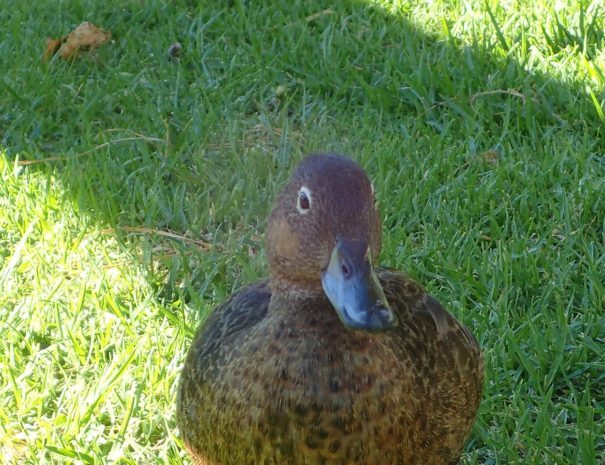 You will get to hang out with 3/4 of the worlds population of Pateke (Brown Teal) and be as near as you will ever get to the rare Kaka (NZ parrot). At camp, a few Banded Rail are always mucking around whilst Ruru(Morepork/ Native owl) provide a gentle soundtrack at night. 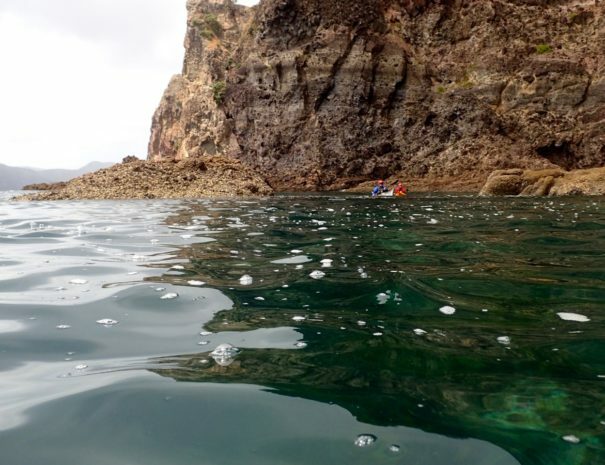 Great Barrier has a wild coast and a slightly less wild coast! 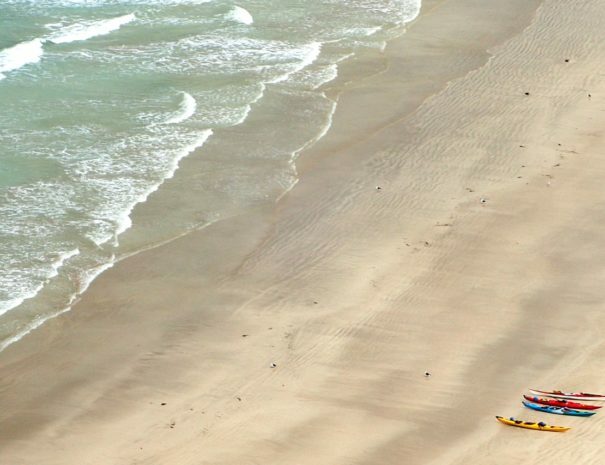 The Eastern side is open to the Pacific with little shelter, many surf beaches and some very committing paddle days! (It’s also stunningly beautiful!) 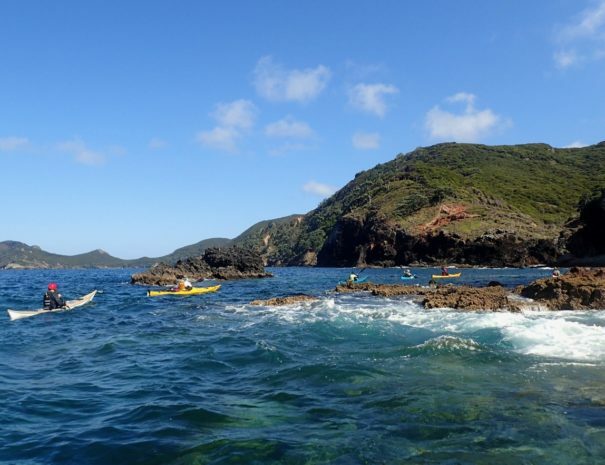 Rakitu (Arid Island) is spectacular beyond belief and a great day paddle when the swell is down. 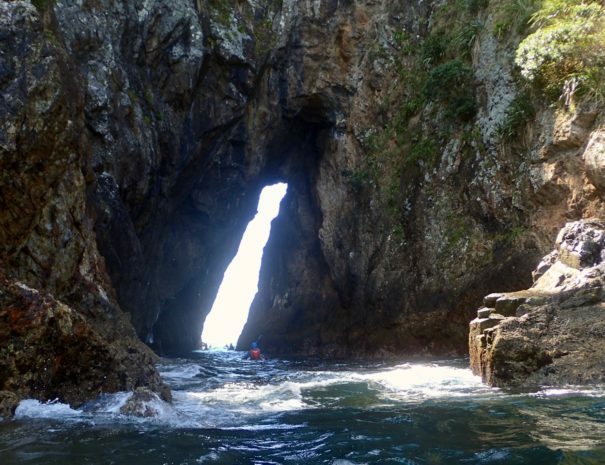 The Western coast is considerably more user friendly to a paddler with a whole series of indented bays just waiting to be explored by kayak. There are numerous stunning beaches to camp on, great cliff paddling and island groups such as the beautiful Broken Islands to explore. Shelter from the open ocean makes this side easier to plan around, but a stiff easterly wind can still kick up a good chop. For those that like to snorkel, the water around the entire island is usually spectacularly clear and the ocean is teeming with life! Great Barrier has fantastic hiking through its prehistoric landscape. Varying from easy walks to visit hot pools, to challenging days climbing the rocky peak of Mt Hobson, there is walking to suit everyone. The tracks make excellent fallback plans when the wind is up and paddling unattractive. Hiking here is a fantastic way to get insight into GBI’s fascinating pioneer history, with relics of both whaling and forest industry littered through the bush and bays. The mighty Kauri trees that brought the loggers can be viewed making their patient comeback in the densely forested valleys. A good road network links the different parts of the Island and for this trip we will use vehicle support. This gives us the option to take advantage of the local conditions allowing us to take in the best bits of the island as and when the weather gives us the breaks. 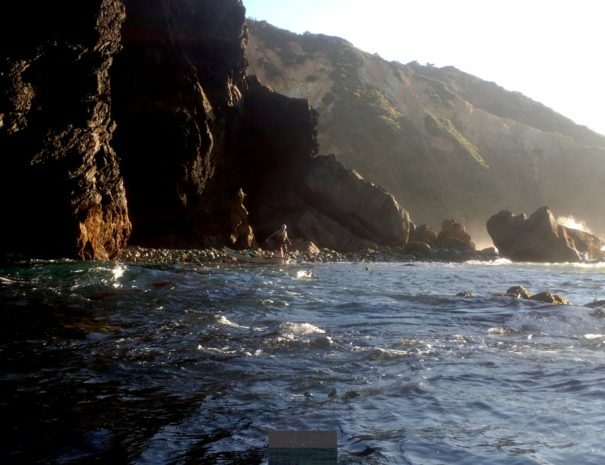 It also makes visiting the Kaitoke hot-pools at the end of a hard days paddle a feasible activity. Having the Van and Trailer close to hand will mean that every day can be packed and adventure filled, no need to be wind bound on one side of the island whilst the other has perfect conditions to play. Discover a unique place in the world! Meet and hang out with some awesome individuals including your caring guides! An early morning start in Auckland to get on the ferry at the Downtown terminal. A 4/5 hour ferry ride through the Hauraki Gulf brings you into Port Fitzroy (think long Scenic Cruise). Here we jump in the van for the 1-minute drive to Akapoua Campsite, our base for the first few days. Time to set up tents, have our first lunch together then set about getting our boats fitted. This done a short afternoon paddle and some rescue practice is first up on our paddling agenda! 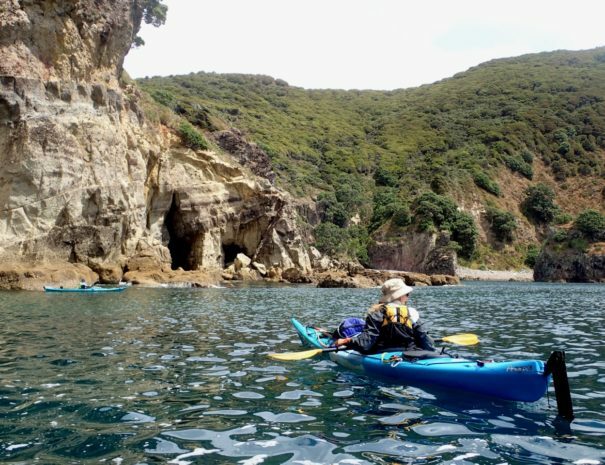 An exploratory paddle of the inner reaches of Port Fitzroy culminating in an early dinner using the Pizza ovens at Smokehouse bay. An evening paddle back to camp for desert and a well-earned sleep. 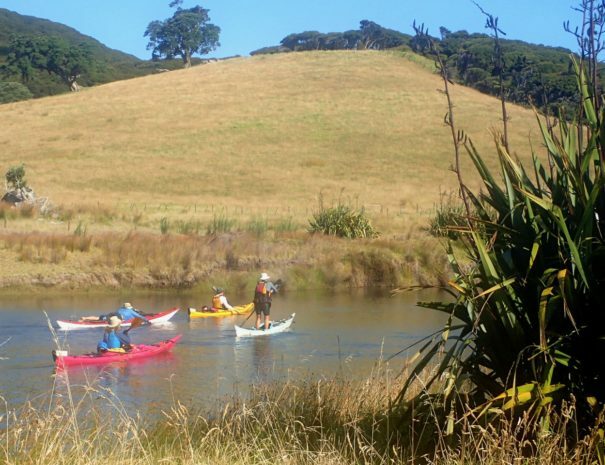 Paddle South to our wilderness camp just north of Whangaparapara Harbour. An exciting day exploring the Broken Islands, lots of narrow passages and great tunnels. Paddle through to the Green Campsite. 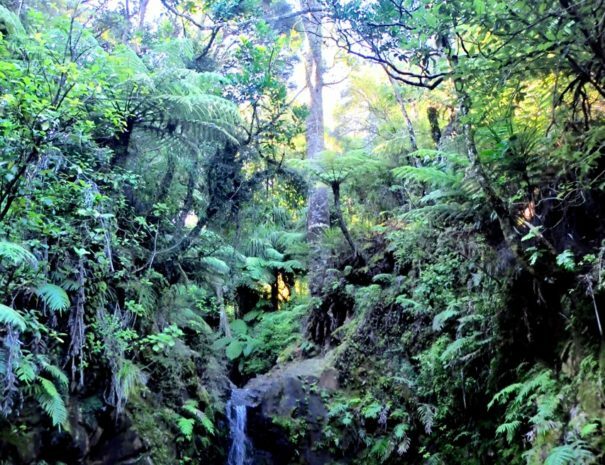 Set up camp and take an afternoon walk to the Kaitoke Hotpools. Getting a view of the East coast swell conditions through gaps in the forest. “ITS WINDY” from the West… (Got to throw in a weather day for posterity) Load up the van as the East coast is now the sheltered side and roll on through to Haratonga Campsite. 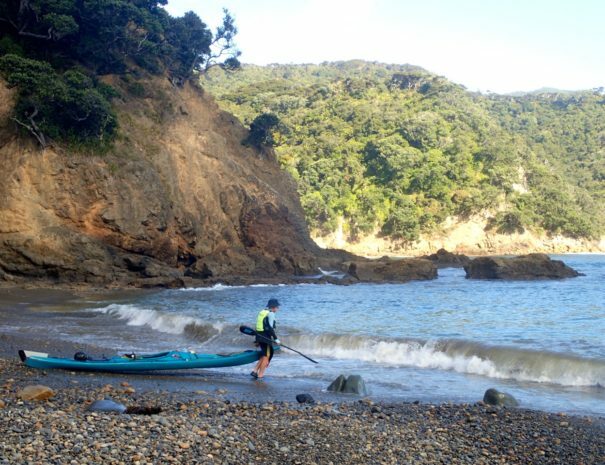 Either explore some of the stunning coast to the North of Haratonga by kayak or take a stroll on the coastal track. “ITS REALLY WINDY” from the West… No option to be on the water today so we’ll dust off the walking shoes, jump in the van get on over to the Mt Hobson track start point. 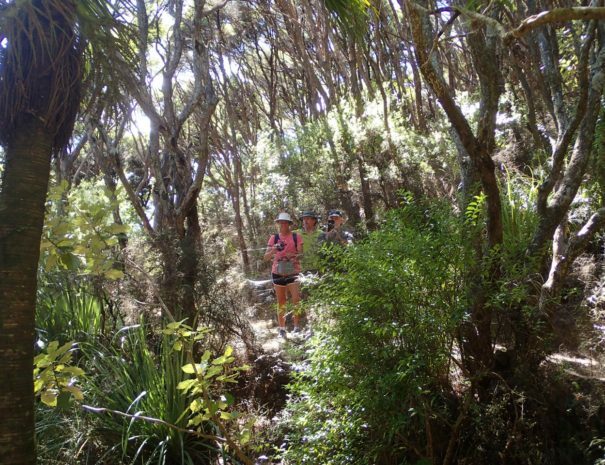 A solid hike to the peak for those that are keen and a leisurely stroll in the bush checking out remnants of the islands Logging history for those that want to take advantage of the break. Now the wind has dropped and the swell is right down, we’ll jump at the chance to head on out to Rakitu Island. 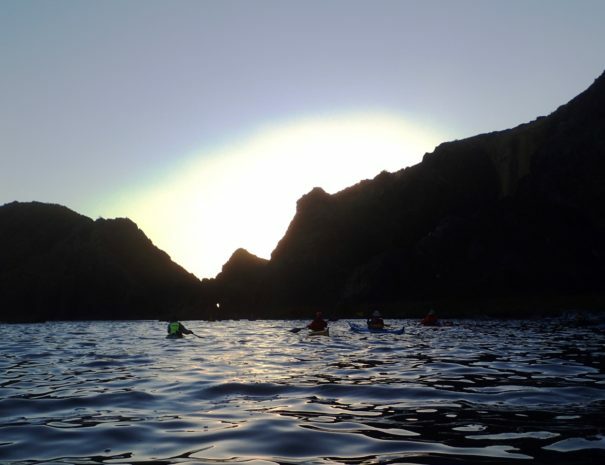 An all day paddle with some great rock-gardening, snorkelling and cave exploring. (Rakitu was Magnus’s top day on our last visit!). A touring day taking in some excellent rock-gardening as we make our way south along the coast towards Medlands Campsite. A great mix of cliff paddling with some breathtaking stretches of white sand beach. We’ll load our gear into the van at the end of the days paddle and drive through to the Bush campsite close to Tryphena. Set up camp and head for our final meal at Tryphena’s Irish Pub (that has a great seafood chowder!). Pack up camp and we’ll get out on the water for one last paddle before boarding the ferry. We’ll have time to get some distance either north or south (both ways are beautiful, it’s a GBI thing!). Arriving to the ferry terminal in time for a quick lunch before we start steaming back to Auckland. Any questions about the expedition?